When it comes to selecting a go-to topper, nothing quite compares to a tried-and-true leather jacket. A fabulous find that always adds extra polish and edginess to both our casual and dressy ensembles, this garment is an absolute must-have. While we already have a few designs in our rotation, there is always room to add another style to the mix. With endless Cyber Monday deals all up for grabs, the Shop With Us team is ready to give our closets an upgrade and this collar leather jacket is just the ticket! See It: Grab the Marc New York by Andrew Marc Felix Stand Collar Leather Jacket at Nordstrom at up to 50 percent off the original price of $450, now starting at $225. 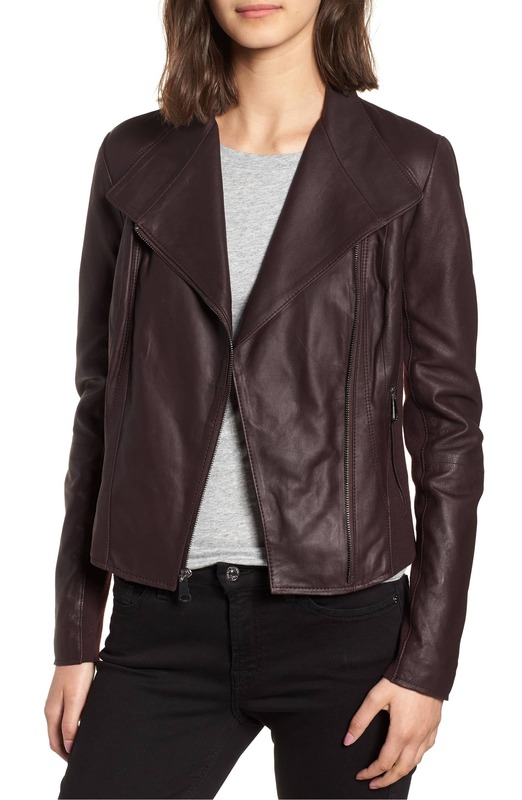 The Marc New York by Andrew Marc Felix Stand Collar Leather Jacket is a sizzling number! 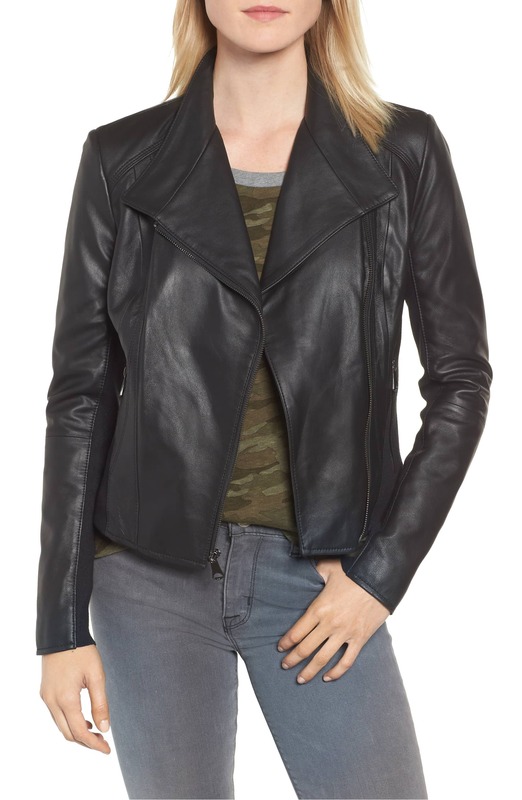 Crafted with a chic moto-inspired design, this piece is the perfect pick for the ultimate biker babe look. Featuring an asymmetrical front zip closure, silver hardware and an open collar, this topper serves up cool-girl style with a bit of edge. Our favorite detail? The elastic knit side panels that add comfort for wearing all day — or night! This topper is designed to nip in at the torso and hit right at the waist for the curve-defining look we know and love! Blending classic styling and modern flair, we can’t wait to hit the sidewalks with this trendy find. We can’t stop swooning over the burgundy pick, too. A stylish way to add a splash of color, this piece will accent any look we have in our closets already. We love adding functional pieces to our wardrobe and we can’t wait to serve up a medley of fashionable looks. For fashionistas that always stay true to classic style, you can also shop this fabulous design in a black shade. Check out its gorgeous finish! Normally retailing for $450, we can score this chic garment at up to 50 percent off, leaving Us with a price tag starting at $225. While many genuine leather offerings can boast a hefty price tag, it feels good to shop a top-quality piece without making a dent in our wallet. A great topper can really elevate an ensemble and pull it all together so we plan on wearing this leather jacket with skinny jeans, over-the-knee boots, a long sleeve tee and a tote bag. For days when we’re running errands, we’re wearing joggers, a T-shirt and slip-on sneakers for an effortless athleisure finish. We can even switch it up with moto style leggings, a bodysuit, strappy heels and a clutch to enjoy a night out on the town. It’s also perfect with a holiday dress to add some edge with a feminine flair. No matter how we decide to style this versatile piece, we can count on making a fashion-forward statement with every wear. The beautiful construction and soft buttery feel make this jacket a winner with Nordstrom shoppers. Reviewers love that this piece is lightweight with a fitted look, while others dig its stretchy build for comfortable wear. Shoppers also like that this design layers beautifully over dresses, while others adore the minimalist design. One reviewer shared that this pick is the “best fitting moto at the price point.” With sizes extra small to extra large currently available in select styles, now is the time to add this piece to our carts. A standout pick during the Nordstrom Cyber Monday Sale, there is no telling how long this jacket will remain in stock. Shopping Tip! Starting Wednesday, November 21, be sure to shop all the best deals at Nordstrom’s amazing Cyber Monday sale. Items are bound to sell out fast so we’re scooping up all the best finds ASAP!